What an amazing trip we have had to Aston Springs Farm. We had such a busy day and participated in lots of lovely activities. First, there was the pottery studio where we made clay mini beasts. Poppy put lots of detail on hers and Aurora really tried hard when rolling the clay. I think it must have been all the practise she has had on baking day with Mrs P! The lady, Sarah, and the man, Will, were really helpful and told us exactly what we had to do. Our creations will be baked in the kiln and picked up in a few weeks ready to take home. We walked around the farm yard meeting all the animals and also got to feed them. The sheep were so greedy and popped their heads through the gate to get as much food as they could! We had to cup our hands and Sam, the lady who was our guide, poured some food into our hands. Isabella had a go with Miss Frisby helping, but she wasn’t very impressed and neither was the poor sheep when she screamed! We went inside the field to meet the hens and saw where their eggs were collected to be sold in the shops. We got to feed them too and had to sprinkle the food on the floor. They were very quick to gobble it up! We also saw some peacocks that showed their gorgeous tails to some of our friends. They are such show offs! We loved the pigs and their piglets that were very lazy and the Daddy pig came up to us to say hello with his muddy snout. We didn’t stay around too long because they were very smelly! The goats were also very eager to say hello when we greeted them with food and Kayden really made friends with them. 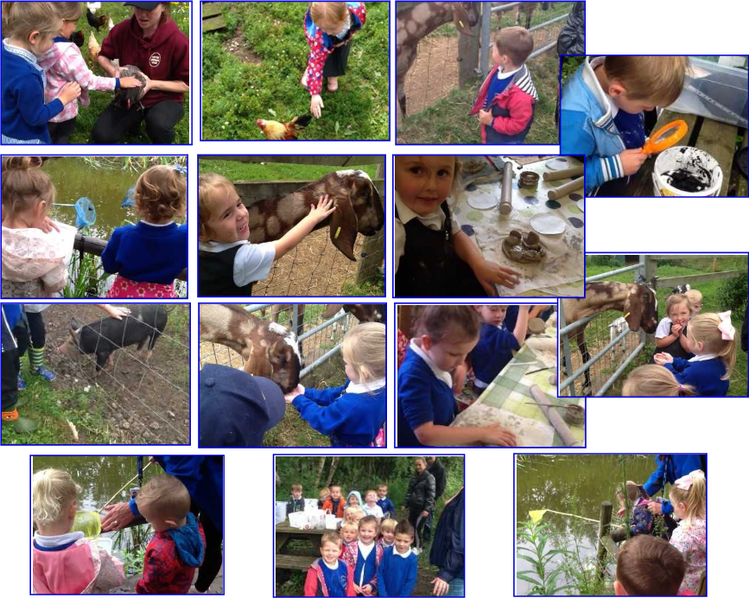 We loved pond dipping and found lots of insects in the pond that we scooped out with our net and had a good look at through our magnifying glasses before putting them back in their home. The insects moved very quick so we had to be fast to spot them. Lunch was an exciting part of the day as we ate our sandwiches in the barn with all our friends. There was lots of tasty food but our friends had to be reminded to eat their sandwiches first before tucking into their cakes! We had a snack and a drink at the stone circle and some of the girls decided to do some singing on top of the large stone. It became quite competitive as to who could sing (shout) the loudest! Evie thought she was in the film Frozen and belted out the songs to anyone who was listening! Simon Cowell, she’s coming to get you! Thanks to the many parents and carers that came along to support us and who were so engaged with the activities too, ensuring all children were having lots of fun. The children were fabulous and such a credit to our school. They were polite and well-mannered and made us all super proud! Thank you for all your generous sponsors for our Den Day. We raised a grand total of £197.54 to be split between school funds and the Save the Children charity.